I’ve been talking with some friends lately about building a joint post-apocalyptic diorama. I started thinking about various factions that could do battle in the wastelands, and came up with several ideas. One was the Iron Mountain Legion. The Iron Mountain Legion is intended to be the remnants or descendants of an elite military unit that was sealed away in a bunker (Iron Mountain) during the war. They emerge to wreak havoc from time to time. Goofy back-story aside, this is my first completed attempt at building a tank. It turned out rather, oddly, if you ask me. It seems almost cartoony. While that wasn’t what I set out to do, I think it’s interesting. It also successfully includes four-wheel steering, which I’m happy about. I’m definitely looking for feedback on this one, so let me know what you think. I was thinking Dwarves in tanks, myself. Ry, I am familiar with that company, actually. I think of them as archival storage, as that’s what we’ve used them for. This is an awesome MOC. Everything in the whole creation just fits together perfectly. The bullet holes are a nice addition. First, I’m pretty sure that a tank by definition requires treads (wikipedia backs me up on this, but I’m no military historian). If I recall an episode of Mail Call properly, tanks have treads because a wheeled base can’t support the weight. 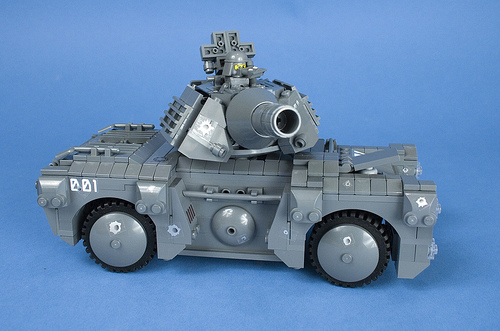 I think the wheels paired with the tank give an impression that it defies physics–I bet if you rebuilt this with treads, it would suddenly look more ‘tank-like’! However, what looks good should trump realism! Second, the squat looking turret is definitely abstracted. It reminds me a great deal of Advance Wars. If the barrel were redone, I think that would also help to make it look less ‘odd’. Note that this is just my analysis of WHY this tank looks odd. I do like the way it looks! :) I especially love the shovels on the rear of the tank: they manage to be a greeble-like detail and a functional bit at the same time. Do they represent a curve to the tank? Or are they tools for the crew? They’re quantum tools! Don’t criticise this! This is awesome. Would it help your opinion of the helmet, if you considered the guy a tank commander, rather than gunner? Could i see the whole minifig? because right now it doesnt really change my opinion, i think the helmet is a little out of place, ill try to think of another one that would work better and let you know….